Natural-Looking Smile Improvements with Dental Veneers? Dental veneers are thin, custom-made shells made of porcelain, used to improve the appearance of a tooth that has been decayed or damaged. The shells are created to look exactly like natural teeth, so that the dental veneer treatment will result to improved and natural-looking smiles. The porcelain shells are attached to the front part of the tooth to bring about the necessary aesthetic improvement. Dental veneers are effective in improving the appearance of teeth that have been damaged, in a more conservative manner (compared to a treatment with dental crowns, which involves the removal of more tooth structure). The porcelain shells will also improve the appearance of teeth that have unattractive spaces in between them, are crooked of misaligned, are irregularly-shaped or worn, or teeth that are badly stained or discoloured. The veneer treatment results to a natural-looking, more beautiful smile. Who Can Have Dental Veneers? A dental veneer treatment results to a much-improved smile without extensive removal of healthy tooth structure. As the colour and the fit of the customised porcelain shells can easily be adjusted, you can look forward to a smile that looks as natural as possible, without obvious signs that dental work has been done. Veneers made from porcelain are also highly-resistant to staining and will retain their beautiful shade for a long period of time. 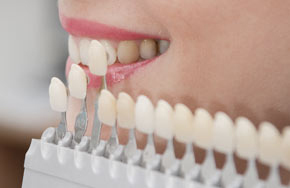 Dental Veneer treatment first involves determining the need for the Veneers, as well as the suitability of the treatment for the specific dental problem. Digital images of the teeth, x-ray images, and dental impressions may be taken in preparation for the actual treatment; a detailed explanation of what the treatment will entail, as well as the predicted results, will be discussed by the dentist. As part of the preparation for the veneers treatment, a portion of the enamel (around half a millimetre in thickness) will be removed to pave the way for the thin porcelain veneer to be attached later on. A local anaesthetic may be administered to the area to ensure that there is very minimal discomfort or pain during the treatment procedure. An impression of the tooth will be taken to aid in the creation of a model, where the veneer design will be based on. Once the dental veneer is finished, the dentist will need to check its colour, appearance, and fit on the affected tooth – before it is cemented permanently into place. Adjustments in the form of trimming the porcelain shell’s edges, or adjusting the veneer’s colour, can be made to ensure that the perfect fit and appearance will be achieved. The tooth will then be prepared with cleaning, polishing, and etching to make sure that the bonding material (and in turn, the veneer) will adhere efficiently to the surface. The bonding cement is applied to the prepared tooth’s surface, followed with the customised porcelain veneer. The bonding cement’s adhesive power is quickly activated with the help of a special light so that the veneer will permanently be attached to the affected tooth. Excess bonding material around the veneer will need to be removed as part of the final adjustments after the dental veneer treatment; the dentist will also check if proper and comfortable bite is achieved, so that changes can be made to the newly-attached dental veneer if needed.